It just wouldn’t be Christmas without a new candle to burn, there’s something so homely, so comforting about watching the tiny flame dance against the darkest of evenings. I refused to light this one from the Isle of Skye Candle Company until the evening my husband and I had finished decorating the tree. I love to savour a new candle, it’s somewhat ritualistic to be honest… if I sparked it up immediately, I’d be killing much of the pleasure. The anticipation is half the fun! I’m also making the most of this brief ceasefire which involves my son being too much of a smallie to be on the rampage, once he’s on the go – I’ll have to restrict my candle addiction to the bedtime hours. Failing that, adoption. 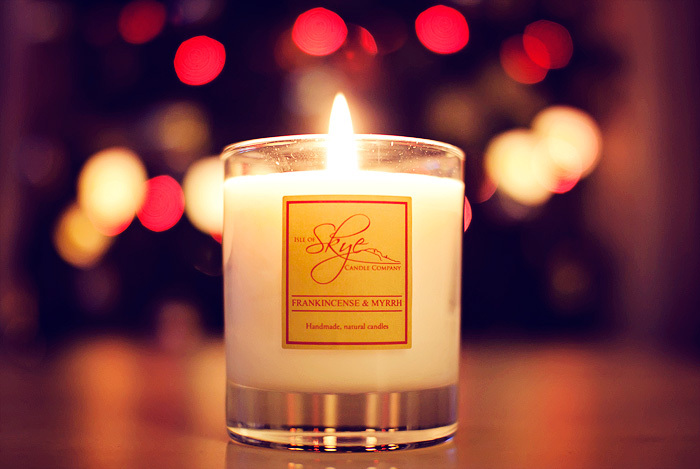 The Isle of Skye Candle Company are specialists in creating hand-poured, artisanal candles. Each one is made with pride in the company’s workshop on the Isle of Skye where they blend a wide array of scents, most of which are inspired by their surroundings in the Scottish Highlands. Frankincense and Myrrh couldn’t be a better choice for this time of year. The delicate blend of sweet and spicy notes float against a rich, woody base that evokes many of the olfactory pleasures one associates with Christmas. It delivers a calming quality, honeyed without being saccharine and mostly quite dry and aromatic. I expected a thicker scent, more resinous but this blend takes a path less-trodden and steers away from the obvious choices. 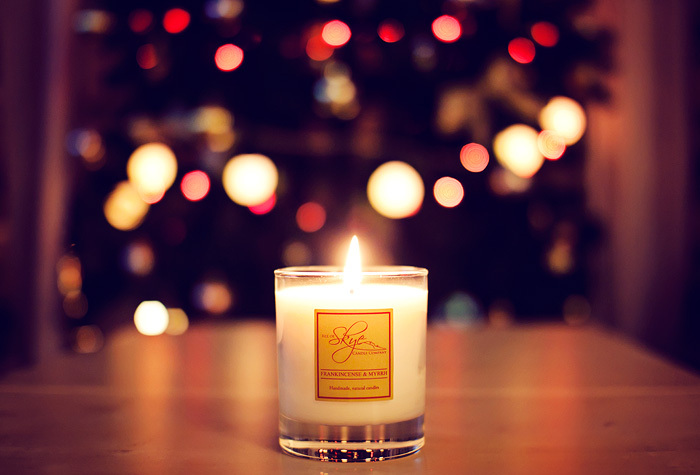 The candle burns cleanly thanks to the natural soya wax. I’m about a third of the way through and the melt pool has been even from the start, infact the surface is as smooth and level as it was before I lit it. Burn time is professed to deliver around 45hrs and if anything, I’m expecting it to exceed its promise based on how it’s faring so far. This particular scent blend is available in a variety of sizes from the Isle of Skye Cnadle Company website, including: votive, travel, single-wick tumblers, and even a triple-wick tumbler for those who like their scent throw to be all encompassing! What a fitting candle to burn at Christmas. I had a great Christmas this year. What about you? Hope it was wonderful. Cute post girl! Where are your latest posts?